Varedan has a long history of providing reliable high performance linear servo amplifiers for OEM customers. 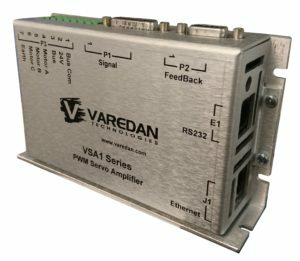 Following that tradition, the VSA Digital PWM Servo Amplifier line extend our product offerings to include advanced digital controls, efficient power delivery, compact footprint, and simple to use tuning and configuration utilities while retaining the reputation for superior reliability and performance. The VSA features a powerful microprocessor to provide reliable, high-precision motor control, stored motion profiles, and real-time scope functionality. The VSA features all standard modes of operation, from current (torque) mode to position mode, and includes external sine commutation mode for compatibility with advanced controllers and legacy applications. All standard forms of encoder feedback plus an auxiliary quadrature port can be utilized, giving the user the highest level of flexibility and freedom.